We continued on SH 88 east of Sims to the junction with SH 27 at Washita. (This was the spelling used for Ouachita back around 1850.) We turned south and reached this crossing in about two miles. The sign at the bridge says "Ouachita River" but it may not be visible in the displayed image. 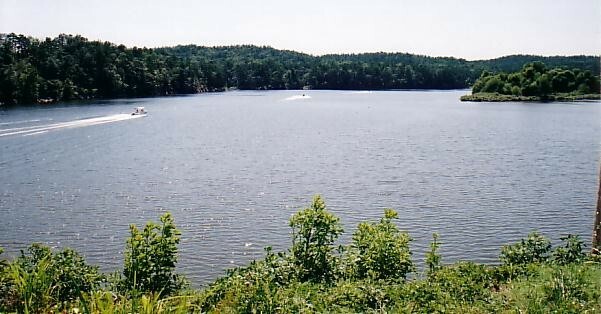 This location is at the upper end of Lake Ouachita, which was formed by the construction of the Blakely Mountain Dam about 20 miles further down stream. Several 'wave runners' and speed boats were running upstream and on the far side the islands in the distance. The trees on the right are on the north shore of the lake at this point. The shore swings around to the south to form the narrow channel that the bridge crosses. The main stream of the river seems to be on the other side of the islands. This sweeping view of the lake is combined from two 28mm wide-angle views. The lake is much larger five or six miles further downstream. The lake surface level is about 500 feet above sea level.